Ah February, the cruelest month of winter. How can the shortest month of the year feel so much like the longest? If you are like me, you’ve patiently suffered through at least three months of cold temps and you are wondering if your frigid body will survive this last long haul. Yes, yes, I know… Spring doesn’t technically start until late March.. the 20th to be exact.. but, the word “March” in my mind changes everything. March means spring. I don’t care if there is still a foot of snow on the ground and its 20 degrees. Spring is here. March means you can plan your garden, you can see the end of sad looking winter produce, and celebrate the soon reappearance of your local farmers market. However, we still have to make it through the 28 days of February. In order to make the long days of February feel a little shorter and a little warmer, veg is going to be celebrating a well loved winter kitchen tradition – soup. Hearty, warm, comforting, and delicious – soup is an easy meal that will definitely help beat the last of the winter doldrums. 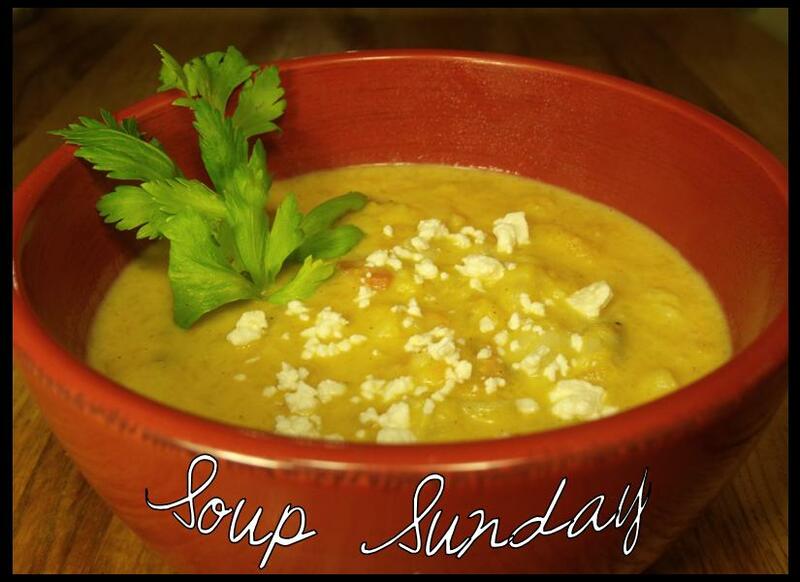 So tune in and link up to Soup Sundays and we will make it to March 20 together. **Sorry this kickoff is a day late! I couldn’t get away from the kitchen yesterday (Superbowl cooking!) to post it! Chop onion, celery, and carrots. Cube potatoes. 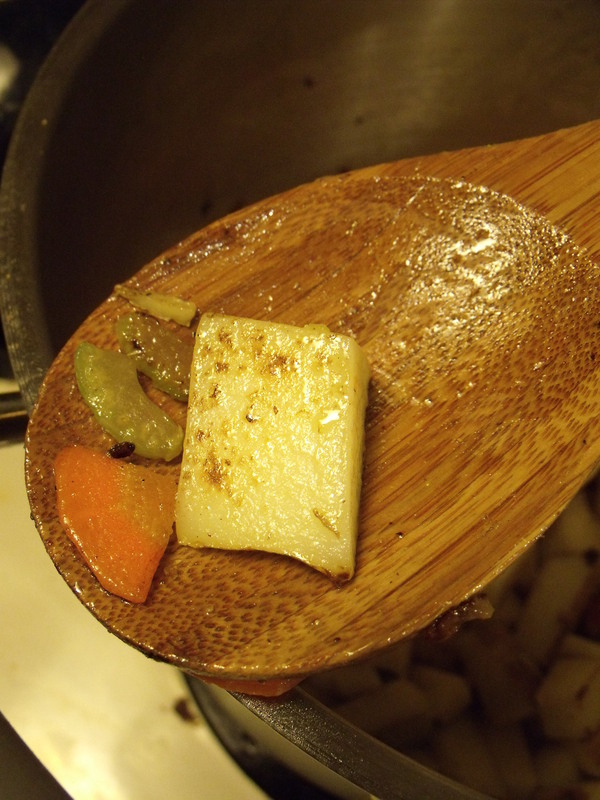 Heat up olive oil or butter in the bottom of a large stock pot and sauté onions, celery and carrots until tender. Fun fact: onions, celery and carrots make up the traditional French Mirepoix (the holy trinity). The flavors are the perfect base for many types of recipes. 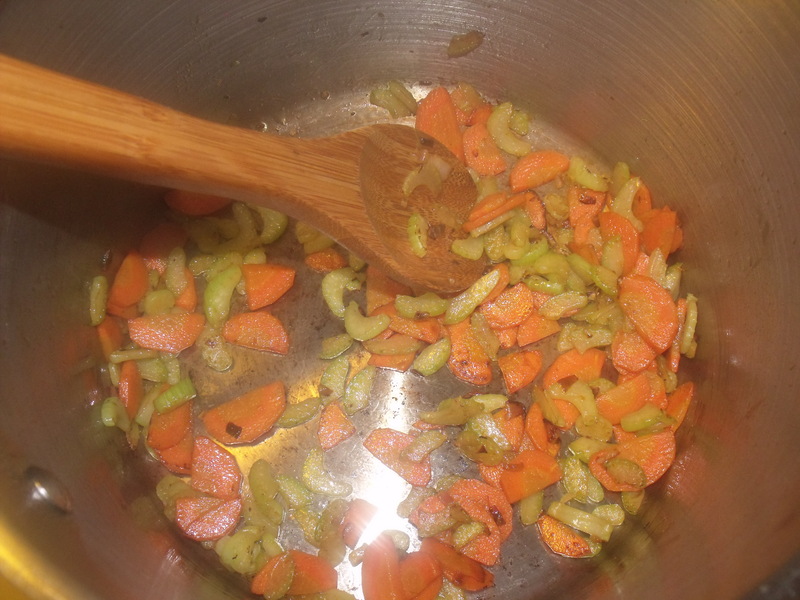 The traditional ratio is 2:1:1 – 2 onions, 1 carrot, 1 celery. Mine is a little bit different, as I am not too keen on the flavor and texture of onions. Feel free to adjust it to your likings as well. 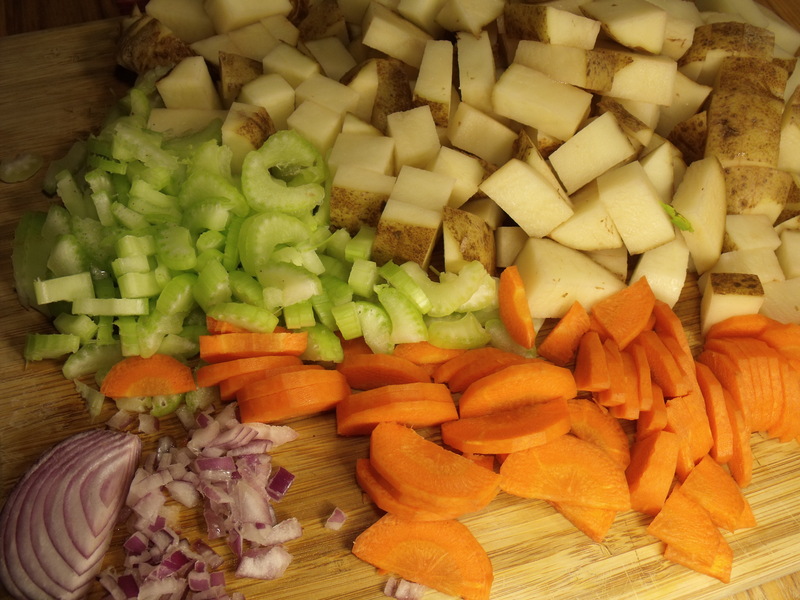 Once carrots, onions, and celery are tender, add the potatoes. The point here is not to cook the potatoes to tender, but just to give them a little color and add to the flavor. You might have to add a little more olive oil or butter because potatoes tend to soak it up. Make sure to stir often to avoid burning (although in my opinion, a little bit of black here and there adds to its rustic charm). 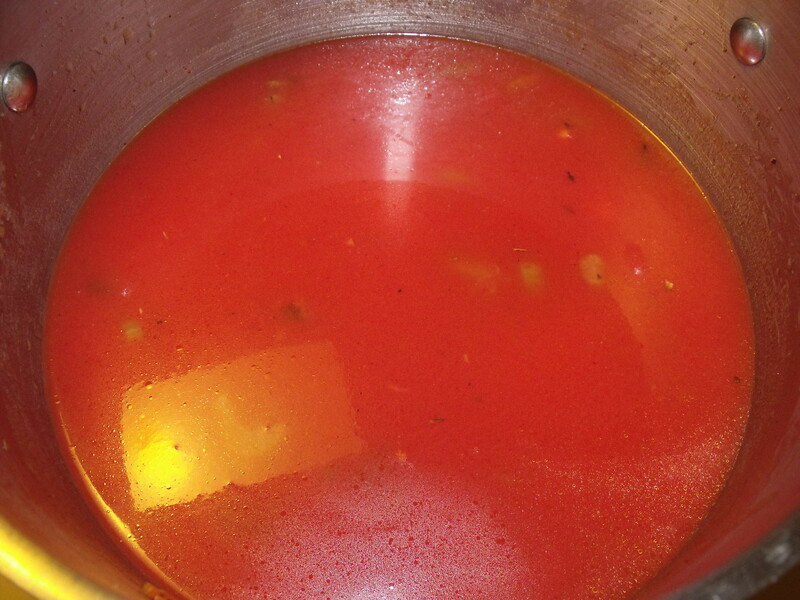 Once the potatoes are golden brown to your liking, add the tomato juice. Fill the empty can about half way with water and add that too. Add beans, corn, tomatoes and balsamic vinegar. At this point you should add your desired spices. 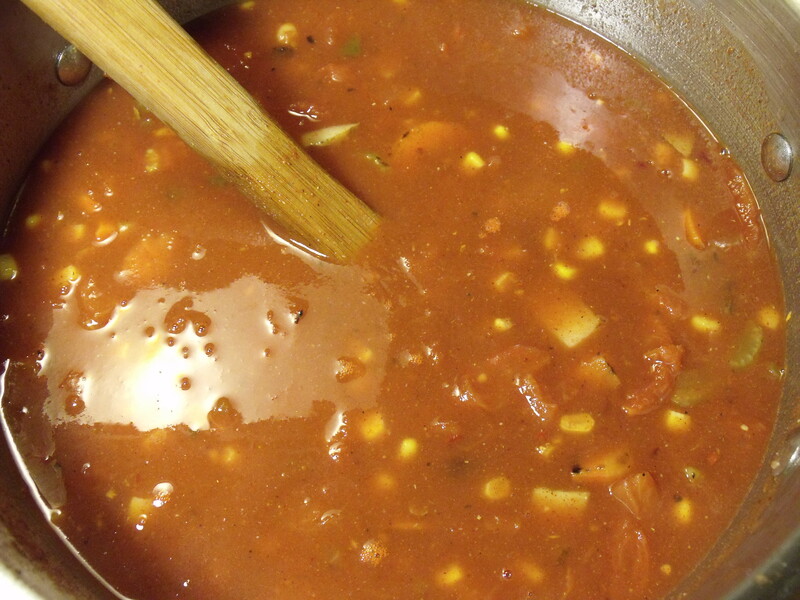 The great thing about soup (and cooking in general) is that spicing is so flexible. For chili, your main spices are going to be paprika and chili powder (to give it the “chili” flavor) – add a decent amount of these. If you love garlic like we do, you are probably going to want to add a decent amount of that too – you could also add fresh minced garlic to the Mirepoix. Everything else is up to your tastes, just add a little at a time and taste as you go. If you aren’t very familiar with spices, two years ago I wasn’t either – this is how you learn! And, believe me, nothing beats being able to throw together your favorite spices to make a delicious meal perfectly suited to your taste buds. The cayenne pepper and black pepper will give it the spicy punch chili is famous for, so take those easy (especially the cayenne) until you’ve reached your hotness tolerance level (mine’s not very high!). The salt will bring out the flavors of the dish. 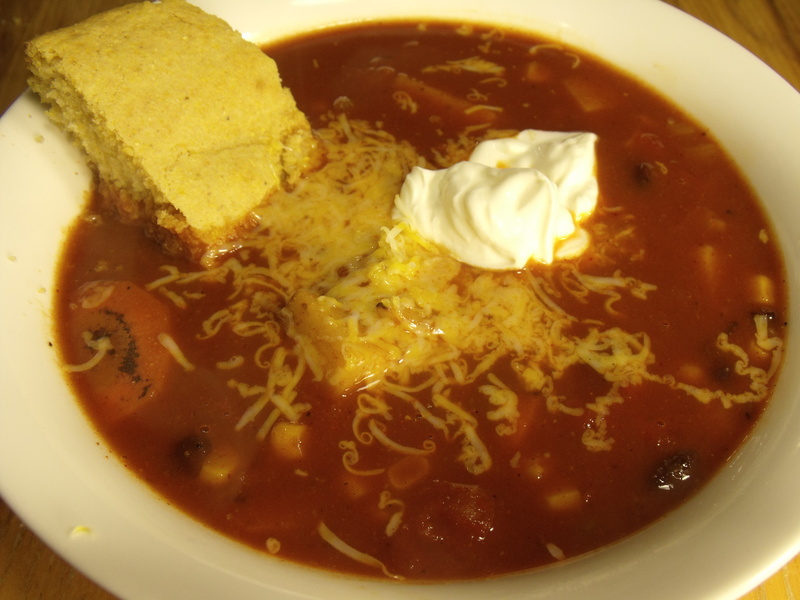 Garnish with some cheese and sour cream if you please and serve with cornbread (also great over rice). Speaking of cornbread, I’m still searching for the perfect cornbread recipe – anybody have one? Mmmm. Warm, hearty, and full of good stuff. Enjoy! What’s your favorite soup recipe? We want to know! Share your link in the comments and I will add it to this post. Thanks! One of my favourite soups is Parsnip and Wild Rice. I hope you like it. that sounds great! I’ve never actually eaten a parsnip before, so I’ve been wanting to try them, but didn’t know what to use them in. Thanks!